Wheelchair Panniers / Scooter Pannier Bags Waterproof. Waterproof and durable, this wheelchair or scooter pannier bag straps onto the side arm of most scooters or wheelchairs- the attachment system is simple but highly adaptable, so these panniers are popular with both mobility scooter and wheelchair users. Wheelchair panniers with a side mount keep belongings within easy reach of the user. 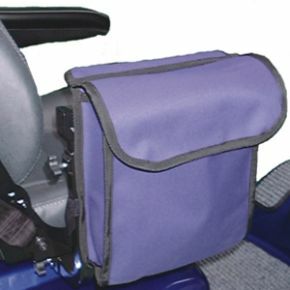 The hook and loop fastening makes the contents of the bag quickly accessible from the chair or scooter seat. These panniers are large enough to hold small items that might be useful on a day out, or a little bit of shopping. Available in three colours to match your scooter or personal taste. Bought for my mother in law who is in a home and wheelchair bound. She loves it and it is very easy for her to get her hand in and out of. Much better than a zip style I had bought for her previously, which broke after a week. Very sturdy bag - would recommend. This is the third bag I have bought like this. They are very handy for all the little things - phone, water, gloves, shopping list etc. They do last quite well but get tatty with use. This is a lovely ,useful bag to go on the side of a wheelchair/scooter.A;though I have a bag on the back of mine, I cannot turn around to reach into it.Now I have everything I need, my purse, phone etc to hand. Bought for my young daughter. She can fit water bottle plus many things she needs in the this bag, which fits on the arm of her chair . In the past she has had to carry on her knee or put in a ruck sack on back of chair, which she can not reach!. I have slightly altered the velro as the flap and the bag do not match as required. Great bag though and really pleased with it. Very good product. A few Velcro straps had to be altered to secure it to fit our scooter,otherwise just what l wanted. I consider it good value for money. This is very useful to me as when I used my powerchair it is awkward to have my hand bag. This product solves the problem beautifully. I now have somewhere to put my purse. It makes it a lot easier.